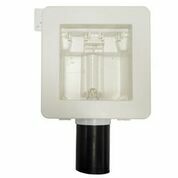 Drain box offers installation flexibility on job sites- left, right or center, split in separate stud bays or on adjacent walls. Integrated mounting system that allows the installer to secure box with nails, screws or hyco straps , universal face plate and available faceplate extension that is stackable to each additional layer of 5/8″ drywall. Also available in Fire Rated version. Rough-in Kit (-RK) includes box, valves and debris cover. Faceplates sold separately.